This summer we took a quick road trip from New Orleans to Sandpoint Idaho to visit my parents. It took us 7 days to drive there doing about 6 hours a day and two days exploring areas. On the way back it took 5 days at about 8-10 hours a day and one day exploring. We camped the whole way there with our two dogs in a small two man pop up tent which was actually amazing. The tent was just big enough for us to all fit and folded up easily for storage. No messing with assembly or poles, I highly recommend it. We also used a blow up sleeping pad because I cannot sleep on the hard ground. It was more expensive than I was comfortable spending on an air mattress but in the end entirely WORTH IT. It blows up very quickly and is small when deflated. Although it isn't thick when it's blown up it was so comfortable and I'm very particular about these things. Again, highly recommended. For this entire trip we never made a reservation at a campground in advance. This was never a problem for us, we always got a spot and made it much easier for us to drive at our leisure and stop when we felt like it. Our first stop out of New Orleans was at North Toledo Bend State Park, Louisiana. Pros: Beautiful park, very few people, we saw fireflies!!! Cons: Very hot (end of June), really loud bugs made it hard to sleep, bathrooms were kind of gross with a lot of bugs crawling all over the floors and counters. Next stop Possum Kingdom State Park, Texas. Pros: Beautiful camping next to the lake which you can swim in, covered areas with picnic tables. Clean bathrooms and showers. Cons: It's a long drive off of the main road. Next, Clayton Lake State Park, New Mexico. Pros: Absolutely beautiful location. We chose a spot up on the cliff and it was a gorgeous view. Cons: Another very long drive off the main road. Bathrooms were okay, not great. In Denver we ended up staying in a hotel because of unexpected hail and it was my birthday. We stayed at the Monaco Hotel which was a lovely spot. 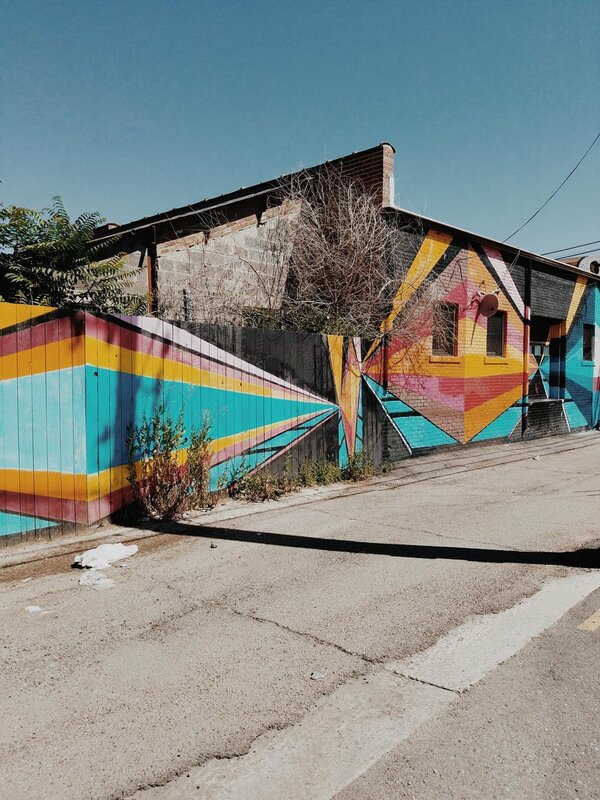 Things we saw in Denver: Rino Arts District worth checking out. Blocks and blocks of beautiful murals!! Next stop Seminoe State Park, Wyoming. Pros: Stunning location in the middle of nowhere, lake to swim in although it was freezing cold. Cons: No showers, porta potty style bathrooms, long drive off main highway. On the drive to Seminoe (very close to the park) we found a small patch of sand dunes, right off the highway, keep an eye out! Next, Gross Ventre Campgrounds, Grand Teton National Park, Wyoming. If you were going to make a reservation this might be the one place I recommend doing so. We lucked out and got the last spot at 5pm. Pros: Right on the edge of Grand Teton National Park, clean bathrooms. Lots of wildlife everywhere! Cons: VERY crowded. Our particular campsite was very rundown and overgrown, we use the picnic table because of this. Other sites looked very nice though. The Grand Tetons are absolutely worth seeing. We had the dogs with us so weren't able to hike any trails but even driving through was gorgeous. Right after the Tetons is Yellowstone National Park and again although many of the trails were not dog friendly there was still plenty to see from the drive through and pull out areas. We ended up buying an annual pass for $80 to the national parks because we knew on the drive back we would be going through Canyonlands and Arches so it was worth it. Last stop on the way there was at Three Forks, Montana. Pros: Nice bathrooms. Grassy spots, very quiet. We ate at a yummy pizza place that was SO GOOD called Gills Goods in Livingston, Montana. The prime rib pizza was the best! Driving back we took a slightly different route. Our first stop was in Brigham City Utah. We stayed at a KOA. Pros: Very clean facilities, best bathrooms. We explored Goblin Valley the next day which was AMAZING!! 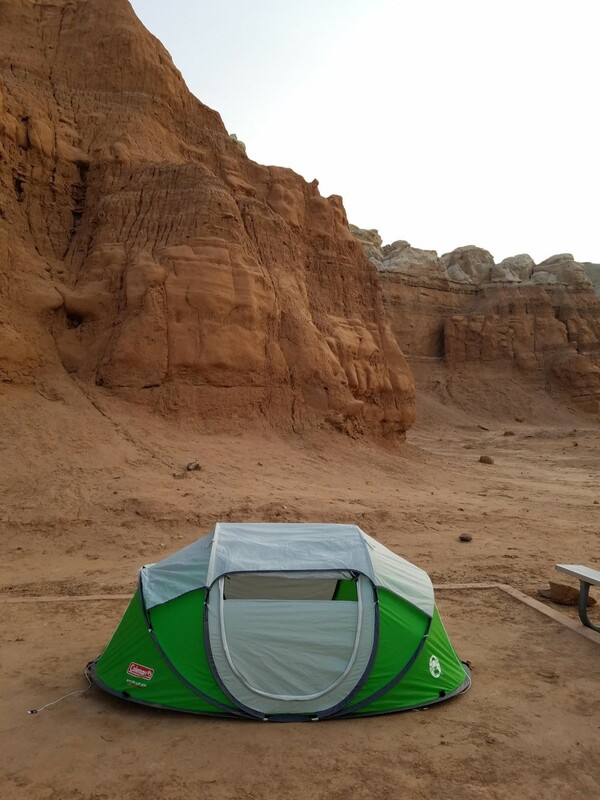 You are allowed to camp there and it feels like you're on another planet. Highly recommend. Pros: Unbeatable location, nice facilities and showers, best stargazing with the darkest skies. Cons: noise travels through here easily with other campers. There is a great trail right before you enter the park called little wild horse canyon which was pet friendly and so much fun. Our favorite part of the whole trip and we had it all to ourselves! Just beyond was Canyonlands National Park. Beautiful drive with a lot of scenic overlooks. We couldn't hike any of the trails because they are not dog friendly. Arches formations, look how tiny the people are! Next spot was another KOA outside of Durango, Colorado. Pros: clean facilities, nice campsites. Our last night we drove for many many hours and arrived at a campsite very late. It wasn't a nice spot, there were tons of bugs and we were exhausted and ready to be home at this point. I didn't even take a picture of the spot. I don't even remember what it was called, Tim thinks it was in Texas and I think it was in Louisiana. Who knows, we were delusional at this point. Sorry, nothing to be missed with that one!